We’ve found even more ways to encourage interaction between your members. We are very excited to announce some great new features that again leverage artificial intelligence (AI) to create dynamic new components for your organization. rasa.io is committed to continually shaping and updating its platform to increase engagement of users in your online community. As we continue to brainstorm new features to optimize your experience, our first question is always, “Will this encourage members to communicate and connect with each other?” Our ultimate goal in creating this platform is to increase engagement for our users, and we are continuously looking for novel and state-of-the-art ways to make this happen. The feature: if your organization has a blog that is located in a separate place from the online community, you can now integrate the comments in both places. You can link a thread in the online community to a blog post, so that comments made on, say, the blog post also appear in the community. How it encourages engagement: this feature allows users to connect from their preferred locale – in this case, either the blog or the community. This integration encourages people who are reading your blog to check out your community – you can even require a login for commenting. Engagement should increase sharply as these users become exposed to each other more frequently. 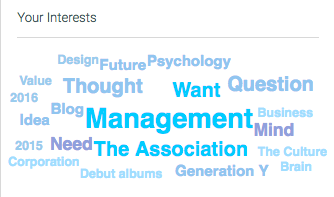 The feature: when a user interacts with your blog or an article in your online community – whether it’s posting their own article or commenting on or liking another member’s article – AI scrutinizes the member’s interactions and generates a personalized word cloud reflecting the things they’ve shown an interest in. How it encourages engagement: this helps members get to know each other’s interests and motivations, as well as helps your staff better understand your users. A word cloud can be a powerful tool that has benefits for any business or organization, allowing you to collect information and even identify new keywords to use that might better resonate with your audience of users. Most important, the word cloud can better connect users, boosting their desire and ability to engage with each other. The feature: when a user is scrolling through the feed, it now suggests members for them to follow. When a user “follows” someone, the things they post appear more frequently in the user’s feed. How it encourages engagement: suggesting members for other users to follow is an excellent way to get some networking happening. It’s not exactly like an online dating service, but it is similar to those online dating sites in that it compares different members and “matches” them based on where their interests intersect, creating a window of opportunity for each connected member. It reduces the feeling of anonymity, allowing members to get to know each other. The aforementioned word clouds are helpful to the organization for this purpose. Each member could sift through the legions of other members, looking for someone with similar enthusiasms and concerns, but they’re probably much more likely to engage when the AI does the connecting for them – it’s quicker and is based on real data. After reading a post or two by the other user, or examining their word cloud, a member has a pretty good idea if this is someone they want to connect with. Your organization benefits from the increased engagement that such connections bring about. The feature: admittedly, this feature is not new to the platform, but it’s so important that it’s worth mentioning here. rasa.io gives your organization the ability to automatically populate your feed with content sources of your choice. It saves lots of time for your community manager or administrator, because with this feature, they don’t have to enter everything by hand. They only have to enter the RSS feed information. You can either choose to pull all of the posts published on a given site, or provide specifications. For example, the community manager could specify, “show Forbes articles, but only if such-and-such organizations are mentioned in them,” and only posts that meet these criteria will show up in the feed, rather than every Forbes article. How it encourages engagement: this is a great way to guide or influence the forming of habits for users, and the habit you want them to form is visiting and engaging with your community! If they know that they’re going to find new articles to read each time they visit, it will become a habit for them; they may even begin to participate in discussions – again, increasing engagement and growing the community. With each new tool that becomes available, you can be certain that rasa.io will continue to explore these new options and build exciting new features that encourage member engagement and ease of use. rasa.io is committed to always growing, always moving forward with the latest innovations and permutations to advance and enhance your organization’s online presence.